On March 31st, Boryspil Airport Terminal F will start operating in test mode. Airport staff are preparing to welcome terminal’s first passengers and service first flights following preservation. Some air carriers were comfortable transferring here all flights from Terminal D. The decision to switch to Terminal F was made by Laudamotion and Ryanair. Terminal F has also been selected as the point of departure by our new air carrier – SkyUp Airlines. Ultimately, the following airlines will also operate a share of their flights from Terminal F: YanAir, Bravo Airways, Bukovyna, FANair, Wind Rose. The list of air lines will be adjusted with time. Thus, starting March 31st there will be TWO operational TERMINALS. Therefore, prior to leaving to the airport, it is important for passengers to verify the exact terminal of their flight departure in order to arrive on time. 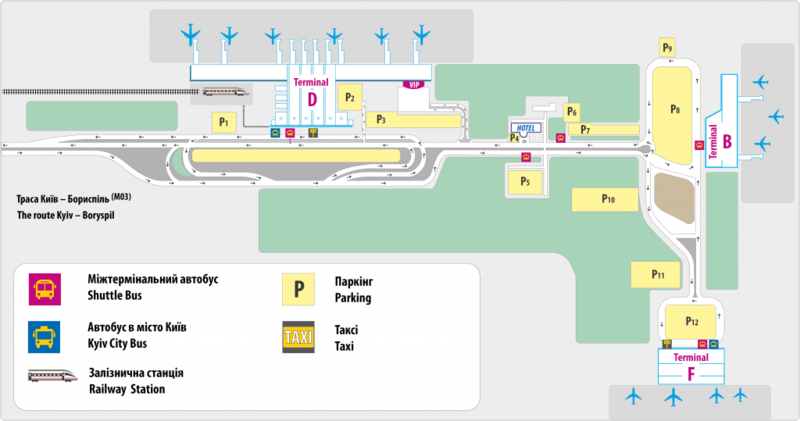 In addition, those who are planning to meet arriving passengers are also recommended confirming the terminal for arrival in Boryspil Airport. Terminal F allows for an expansion of opportunities to attract carriers that operate using different business models. In particular, Terminal F is better suited to implement low-cost technology such as boarding directly form the terminal. As a result, the airport will provide a more flexible flight service and implementation of technologies for both regular and low-cost charter carriers. We do not offer Terminal F to the airlines that service transfer passengers or have a “code-sharing” agreements with other air carriers and operate in Terminal D.
A free shuttle bus will run every 30 minutes between terminals. Terminal F passengers, arriving to the airport on Kyiv Boryspil Express, will conveniently board the shuttle bus on a stop near Terminal D.
Please arrive to the airport in advance and take into account that starting March 31st, Boryspil Airport will have two operating Terminals – D and F.
When buying a ticket, please ensure the terminal of departure. Terminals D and F are located at a distance from each other. The transfer between them takes time, a free shuttle bus runs every 30 minutes. If you have arrived (or depart) by Kyiv Boryspil Express, the best way to get to (from) Terminal F is by riding a free shuttle bus. Shuttle Bus departs from Terminal D (first level).